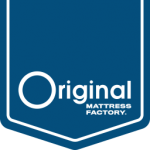 At The Original Mattress Factory, most of our models have specially designed handles attached directly to the innerspring so that they do not to pull out when moving, flipping or turning your mattress. Be sure to ask a sales associate about the type of handles used on your mattress. Some companies tout the benefits of using gel or gel-infused foams to keep you cool and relieve pressure points. According to recent studies though, those claims are questionable. First of all, “sleeping hot” is an issue that only affects a small percentage of people. This issue is even less common for those sleeping on an innerspring mattress, as innersprings allow air to circulate more freely than an all foam mattress. It is also debatable whether or not gel has any true cooling benefits. Consider an ice pack filled with gel. It will be cold right when you take it out of the freezer, but after a relatively short period of time, it will warm up first to the temperature of the room and then further to your body temperature. Recent studies have brought into question whether gel has any benefits at all with respect to cooling, especially considering the small amount of gel material used in most mattress applications. In addition, it is possible that the use of gel lessens the durability and longevity of the product. Another issue is that the mattress pad and sheets you should be using to protect your mattress eliminate direct body contact. As a result, the insignificant amount of gel used in these mattresses cannot provide any benefit to the consumer, even if gel is proven to have advantages. In sum, consumers should be wary. Paying premium prices for a mattress based solely on its inclusion of gel may not be a smart buying decision. It is certainly not a good value. A King size mattress set comes standard with split box springs. Sometimes, people also need split box springs for a Queen or Full size in order to move the box springs into older homes or up tight stairways. There is an additional charge for split box springs on Queen and Full sizes, but sometimes it is the only option to negotiate a tight stairway or avoid damage to your walls. Split box springs offer the same support as a one piece box spring, but require the use of a center support on your Queen or Full size frame. Low profile box springs are typically 3” shorter than the regular 8” box springs. Since the trend is plusher, thicker mattresses, these box springs allow you to get the comfort you need at a height you can handle. If you are interested in low profile box springs, make sure they are built to offer the same support and durability as regular height box springs. Avoid those that use straight wire or a platform construction which offers no shock absorption. If you use a dust ruffle or bed skirt, a low profile box spring may affect the skirt’s height off the floor. Hinging allows a mattress to be bent without damaging the spring unit when delivering in tight stairways or doorways. It does not affect the durability of the mattress and can be a big benefit when moving in tight spaces. 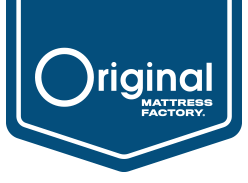 At The Original Mattress Factory, our King size mattress sets are hinged and can be folded from head to foot. We will also hinge Queen and Full size mattresses on special request. Hospital beds and adjustable bed mattresses are gatched to allow them to bend at the head and foot. Gatching allows a greater area of an innerspring to be bent without causing damage to the coil system because a significant portion of the border rod on both sides of the mattress has been removed. Some mattresses are advertised as having memory (viscoelastic) foam and/or latex foam inside. The majority of these mattresses do not have a foam core and contain only a thin layer of memory or latex foam that is located deep beneath the upholstery layers. Used in this way you cannot feel these foams and do not receive any of the features or benefits they have to offer. Before you buy, make sure you understand exactly how much specialty foam is used and where it is located. At least 2” of viscoelastic or latex foam near the top surface is recommended. Mattresses that combine two or more bedding materials together into the same product have recently been coined “hybrids.” In reality, this concept has been around for a very long time as innerspring units have been combined with cotton, wool or foam to create multiple layers and unique feels. Today’s hybrids typically refer to the combination of innersprings with latex, memory foam or even thin layers of coils called micro-coils. While many different benefits are marketed to consumers, the true benefit of a today’s hybrid mattress is that you can experience some of the unique comfort characteristics of specialty materials while retaining the feel of a traditional innerspring support system. Posturization is the concept of creating regionalized comfort or firmness zones in a mattress or box spring to provide varying degrees of support relative to the weights and contours of one’s body. The theory behind posturization is that heavier, more pronounced parts of the body, such as the hips and shoulders, need more support than lighter, less pronounced parts, such as the head and feet. The marketing story behind this type of zoning is that it allows the body to maintain a more normal position of function (better spinal alignment) during sleep. There is little information available to either support or deny this claim. However, due to the fact that each person has a unique combination of shape, size, weight, contour and sleeping habits, it is difficult to believe that a mattress with fixed support zones would be appropriate across the board. Zones may prove to be too wide or firm for some people and too narrow or soft for others depending on individual physical characteristics and sleeping habits. For these reasons, posturization is not used in any of our products.